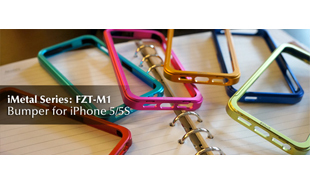 Taipei, Taiwan –FZtech is pleased to introduce the latest collection for iPhone 5S, iMetal Series - Metal Bumper FZT-M1. The protective and metal surface bumper is made of high quality aluminum alloy with aircraft-graded rubber inside. It is designed to protect iPhone 5/5S against impacts and scratches, offering the solid protection for the edges of device. Weighting only 25g, iMetal bumper FZT-M1 is lightweight and ultra-thin. The bumper covers the edges of device with 9 color options, and then user can choose their favorite color to match iPhone 5/5S, creating the personal style. There are the colors: black, silver, shadow, sky blue, pink, navy, maroon, orange & greenish yellow. M1 is easy installation by easily slide in and slide out the clip, and then iPhone 5S can be safely place on the bumper with premium protection. FZT-M1 is made of high quality aluminum alloy with aircraft-graded rubber inside. Without the forging made, FZT-M1 is made by solid aluminum by CNC craftsmanship, perfectly designed to protect iPhone 5/5S against impacts. iMetal Series is the first series of FZtecn in mobile accessory, the key features are high quality aluminum alloy, lightweight and portable everywhere. iMetal Series FZT-M1 is available in Taiwan, Singapore and Thailand. FZtech welcomes enquiry from global distributors, retailers and wholesalers. For more information please visit FZtech online.